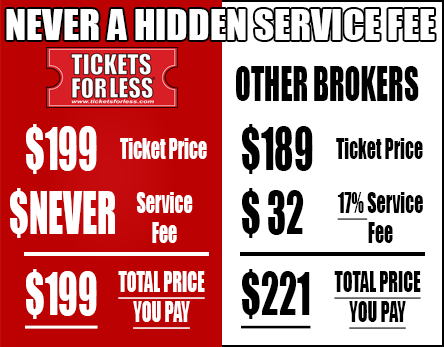 We believe in ‘all-in’ purchasing when it comes to our tickets because hidden service fees can dramatically increase the your purchase and force you to over-pay for your seats. Other sites show you one price, but as you finalize your purchase, tack on service fees. Why would you want to pay more than you have to? Tickets For Less is the ultimate source for tickets, offering seats to see your favorite professional or collegiate sports team, concert or live performance, all without any hidden service fees, so what you see is truly what you get. Having been in business for 11 years, we never have and never will, tack on hidden service fees to sky-rocket your costs. Know what you’re paying for. Head to Tickets For Less and never miss out on your chance to see the top sporting events, concerts, and shows at incredible prices.